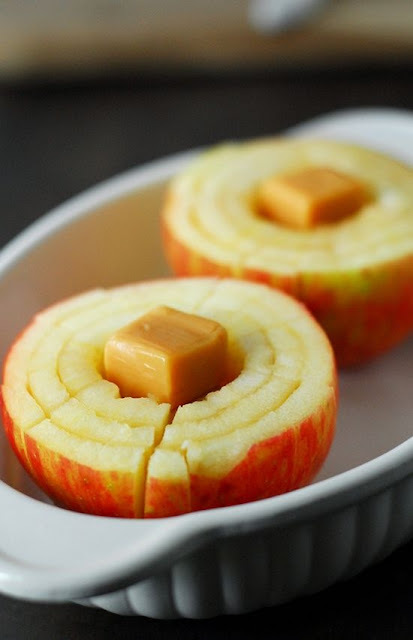 Every year we wait for the fall and apple season to come around! Growing up, we had an apple tree in our backyard. I remember my grandmother coming over to help my mom freeze apples. We had an apple peeler/corer that was a big help. My mom froze the apples for pie filling. All winter long we would have delicious, homemade apple desserts. This year, we are already enjoying the apple season. The bottom drawer of our fridge is full of apples. Vanessa is excited because she got her braces off and can easily eat apples this fall! I used some of our apples to make these delicious Bloomin’ Baked Apples.